Content marketing is one of the best strategies you can embark on, as long as you have something to say, information of value to share with your audience. However, being engaged in content marketing means more than the regular blog posts and a few updates on social media. Today, I am going to talk about something similar and yet, different: the Quora based content marketing. Together, we are going to learn about this strategy, step by step, starting with defining the platform and up to some Quora marketing tips and strategies that will guide you through the entire process. Quora is a question-and-answer site where the main contributor is its huge community of users. People ask questions regarding different topics that are relevant to them and all the other users, considering they can provide relevant knowledge, can answer their questions on site. Questions are asked, answered, edited and organized by the community. Why use Quora as a marketing tool? There are many reasons to start using websites such as Quora for a marketing strategy. One of the first reasons to sign up for the service is its huge community and its “real name policy”. This means that users are required to register with their real names and not with screen names or pseudonyms. They will not verify each and every user but you can lose your account if others report you as being untrue to who you are. The real name policy is great for the trust you build with your audience and your overall influencer status. The more questions you answer, the better your content is, the more likely is that the community will begin to trust your inputs and regard you as a professional in your domain of activity or interest. The real identity helps the trust build within the community but at the same time, it gives authenticity to Quora itself and as a consequence, to your given answers which become tied to your own personal brand. Quora has its own ranking system that recommends the answers similarly to what Google does with their page rank system. Also, it recommends questions to their users based on what they deem to be important for them. This way, if you are trying to attract a specific audience with your content marketing campaign, you are most likely to reach it based on this algorithm. The answers are ranked based on two main strategies. First, there’s the upvote/downvote system which allows users to vote for an answer and secondly, there’s the “suggested edits” option. With suggested edits, users are able to make suggestions on how an answer can be improved. Finally, Quora has implemented in 2012 a system that encourages contributors to continue writing for the platform. Top writers are being recognized for their efforts and even gifted with different types of goods to keep them interested and engaged with Quora’s audience. 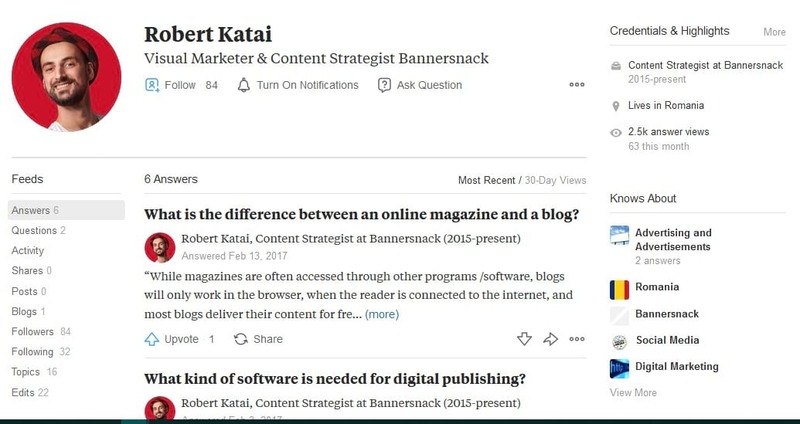 Unlike other types of content marketing, with Quora, you don’t have to start by designing a strategy and targeting an audience. There are specific groups already there, based on different topics of interest and, as long as you write about what you know, there are good chances your texts will be discovered by your potential readers. How do you start, therefore? Use your real name. We’ve already covered this aspect. Quora is based on truthfulness and authenticity. Moreover, using your real name will help your marketing strategy. You will build a reputation based on this name and market your personal brand to the community and to the outside world. Upload a picture of yourself. Use a real picture as you would do on any other social media profile. This will also help build trust with your audience and score points in this area. Input your credentials. Describe what you do in 60 words or less. This tagline will appear next to your name on all posts. For example, if you answer questions about languages and you state the fact that you are a linguist or something related, there’s a good chance your words will be taken more seriously. Based on what you want to advertise about yourself, at this point, you can populate the region with info regarding your education, your profession, where you live and what languages you speak. There is also an additional credential section where you can add a few words about your profession, education, location etc. Write a brief profile description. Use this opportunity to link your social media profiles, your website or your blog. This part is very important considering you are here for marketing purposes and not just for fun. Finally, you will be prompted to enter a few topics you “know about”. Think about the subjects you can contribute to and be useful to the community. You can add as many as you like but my advice would be to focus on what you know better. Here’s how my profile looks like. As you can see, there is a lot of useful information linked to this page, information that can help those who land there, understand and know the contributor. 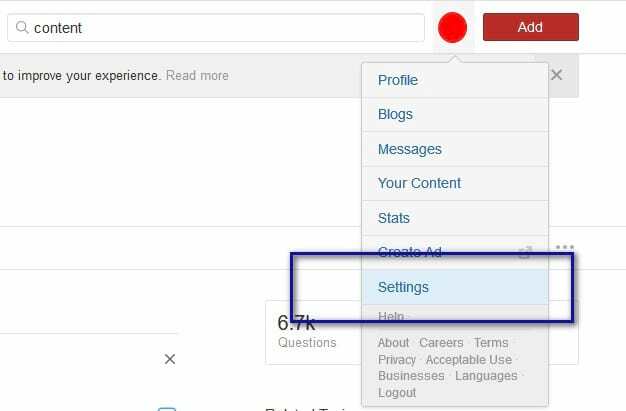 Other Quora users who are really serious about the platform or interested in the topics covered by you, will be able to learn more about yourself based on your profile and personal description and follow you. Also, there’s a good chance some of your fans will also check out your blog or social media accounts and follow you there as well if they like what you write, how you write it etc. How to find and follow topics? Once your profile is set up, you can begin your work. Before becoming a contributor, however, the next logical thing to do is to find the topics you are interested in and follow them so that you will be always up to date with everything that happens in your area of expertise. Just click on a specific topic and get to its main page. You will see the latest feed updates and also a button for subscribing to it in the right corner of the screen. You can also select to receive questions and answers regarding your chosen topics via email so that you will not miss anything of importance for you. In order to do so, click on the settings icon available under your profile icon in the top right corner of the screen. Here, you can select to enable E-mail notifications. After this long introduction, I am sure you have a lot of questions regarding your Quora marketing strategy and how you can use this platform in order to achieve great results in the long run. Let’s start with the obvious and move on with some really interesting choices you can make here. Now that your account is set up, you have selected your topics of interest and maybe even read a bunch of questions and answers in order to get used to the platform, it’s time to really start your Quora marketing endeavor. It’s time to start building your personal brand and if you are a marketer, grow awareness of your products or services. Well, there’s only one and only one thing that is important at this point. You need to share some informative answers with the audience. Start publishing on Quora and wait for the results. Where do you find what questions you can answer? When you log into Quora, you will immediately find some suggestions. You will be presented with some questions you can answer, based on your interests and based on what the platform has learned from your profile and your daily activities. This is only one of your options, however, there’s more. You will also receive, if you are willing to, E-mail notifications on the questions you might be able to answer based on the same data inputs we’ve talked before during the previous paragraph. Finally, if you are active on the network and you are able to build up a reputation, other users may also ask you to answer some questions. You are not obliged to do so but, I would recommend you to do it. You will grow your influence and score some extra points with Quora and the community that follows you or some of the topics you are interested in. There are great things you can achieve on a platform such as Quora but at the same time, the temptation to overly sell yourself or your brand is quite high. My advice is to carefully weigh all your external links and never abuse this opportunity. Carefully weight every question and think about the best answer you can give in simple, comprehensive and short sentences. Be informative and at the same time, do care about how you write, pay attention to the readability of your text, the quality of your wording etc. If available, link back to some other pieces you wrote that might be considered great answers to the standing question. You can also include a short excerpt of that text so that the community will know where and why you are sending them. If possible, you can also cite sources, other than your own articles, in order to outline your opinions. Include images if they can help the reader better understand your answer. Images are eye-catchy and they can make your answers more noticeable. Include a link to the brand you are marketing but only if mentioning its name is relevant to the context. 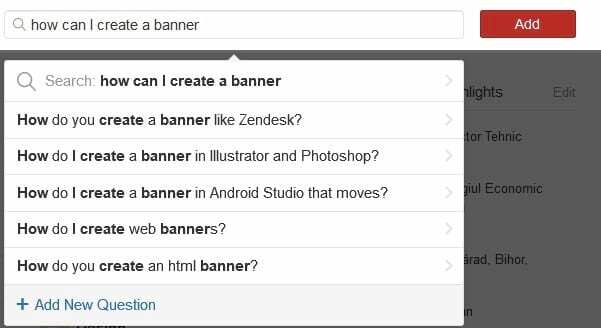 For instance, I got to mention Bannersnack as a solution for banner design when I answered a question related to this topic. Do not over-promote yourself or your brands. It’s easy to make such mistakes and the temptation is quite high considering that you are allowed to backlink with Quora. Give brief answers if needed but do not give answers that are too simple such as Yes/No/Maybe etc. Do not offer fake expertise and don’t share fake data with the audience. If you do not know the topic quite well, refrain to give answers to questions related to it. Do not argue with other people and do not try to ridicule them even if they are mistaken. Quora is open to everybody and therefore, you can find ridiculous questions posed by people who do not know a thing about a topic you are expert in. Answer them but refrain from being ironic or judgmental. Stay positive if you want to expect good results. 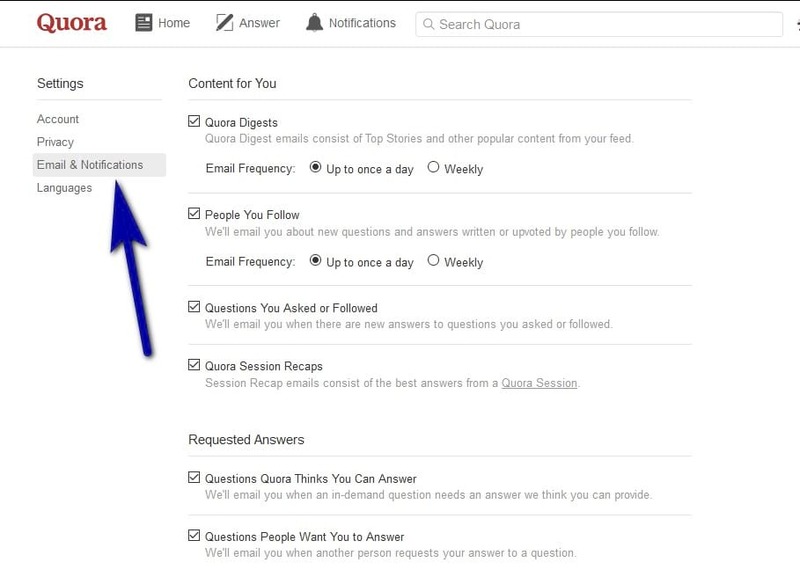 Quora can be more than a personal brand marketing platform. You can use it to market services, products or companies as well. 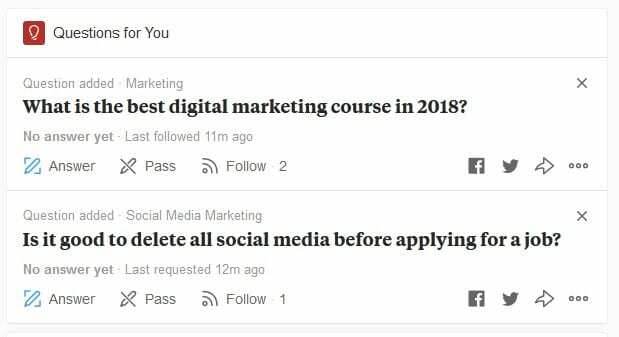 In order to do this, you can either answer questions related to the brand you are marketing on Quora or, create questions that do the same thing. You can also answer questions and give the audience answers that market the same brand or service. Tip: Follow all topics that are specifically about your services or business and keep an eye on what other people write about them. Thus, you can join the discussions whenever a question regarding your brands of concern appear and use this opportunity to answer them properly and grow awareness on them. Another perfect way in which you can use Quora is to scope for ideas for your websites and blogs. I am talking about really good ideas for content marketing, based upon keywords and of course, the general interest. 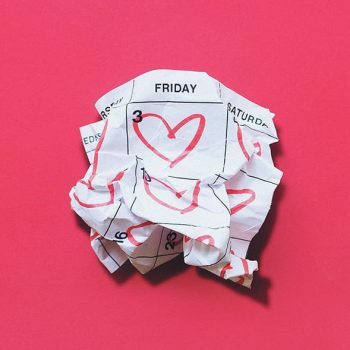 Maybe I am the first marketer who suggests such a thing but heeds me out, it really works. Content marketing is all about answering questions and delivering valuable and interesting content to an audience based on some of their most astringent questions. Therefore, while it might seem weird at first, it is not a bad idea to scatter Quora for questions and construct your posts and articles based on them. Search for questions you can address on your blog, website or social media channels. Quora is a great website for building your brand and growing awareness of yourself or the brand you are marketing but at the same time, it is a great source for ideas and inspiration. Search for questions you believe they need better answers. 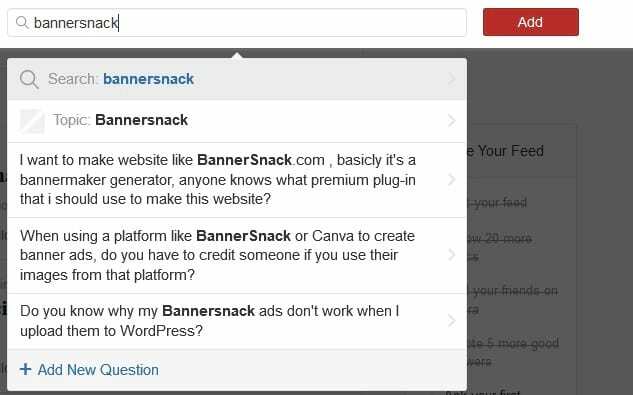 You can answer them on Quora but at the same time, you can answer them on your own blog or website and only, therefore, publish answers on Quora with links to your blog. Also, you may search Quora for specific related questions and answers you might consider worthy for your own blog or website. There’s a lot of information to be covered on a specific topic, and I guess Quora is not exhaustive when it comes to this. Study the market! 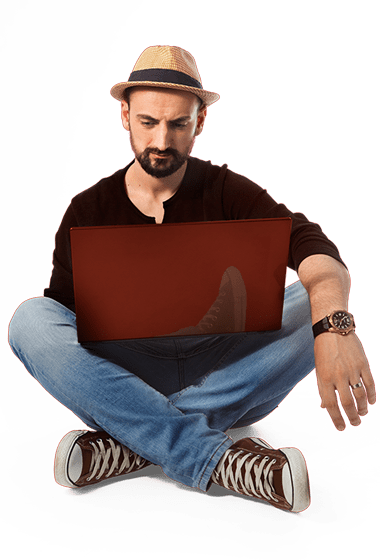 Yes, Quora is a great place to do this and you will be astonished about how easy is to conduct a market study on this platform. What can you do? Well, look at the questions, look at the answers, look at the up and down votes and based on this data, build your own strategy. Quora is a great place for such a study because people come here to ask questions, read answers and get informed. 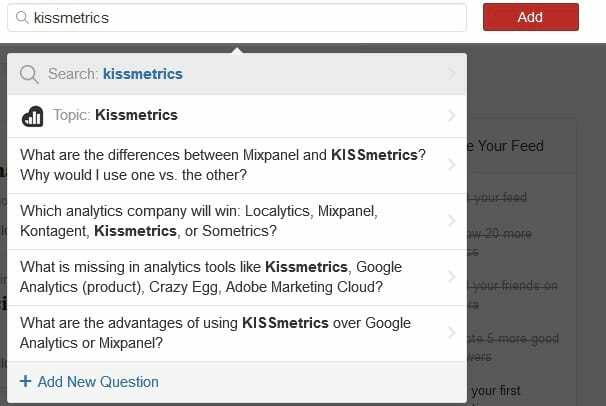 At the same time, you can use Quora as a keywords database. Based on the same data we’ve already talked during the previous paragraphs, you can study the topics you are interested in and find out what people are searching in need for answers. Based on this, you can come up with some really useful keywords and key phrases which you can use on your own blog or website. Another great strategy when it comes to content marketing is to create a blog on Quora itself. Go to your profile, select Blogs from the left side menu and then, select create a blog from the top tight link, as you can see on the above image. Yes, you can create a personal blog on this platform and write about the topics you know about and even market some of your brands and services. The blog feature functions like any other similar feature and as a consequence, you are able to input data regarding anything you know and you can do it whenever you want, regardless of what questions the community poses. In many ways, this is not different from a self-hosted blog and therefore, it is a great channel for content marketing. Who is using Quora and for what? How are they implementing this social platform in their marketing strategies? There are a lot of brands you can find on Quora. And, at the same time, there are a lot of marketers who are talking about these brands whenever a question related to them is posted. 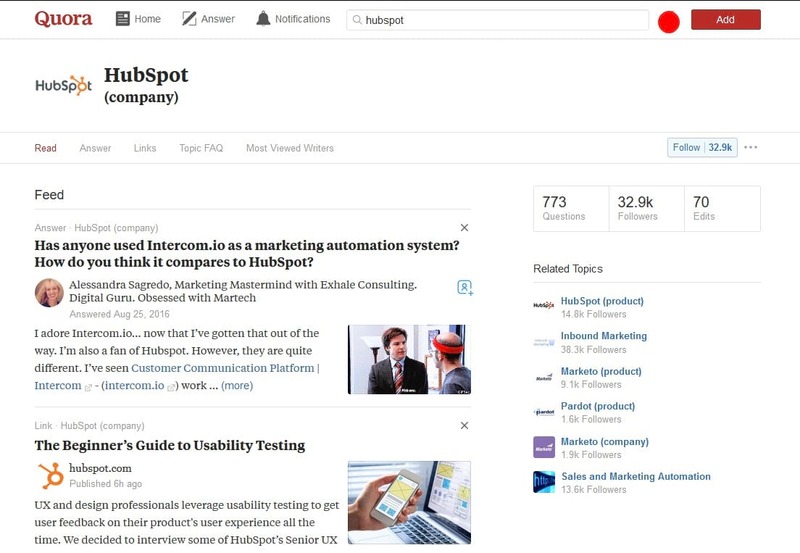 For instance, there’s a Hubspot page, If you are looking on Quora for this company. The feed collects all the questions and answers that are related to this brand. Also, there are contributors who share info on this specific company and other related data such as Dharmesh Shah, co-founder, and CTO of Hubspot who is also an active member of Quora. Whishpond is yet another website that uses Quora for content marketing. Here, they have a really interesting and informative article about their reasons and at the same time, how they did it. A written proof about the efficiency of Quora and why use it in the first place. Finally, another good example comes from Buzzsumo. 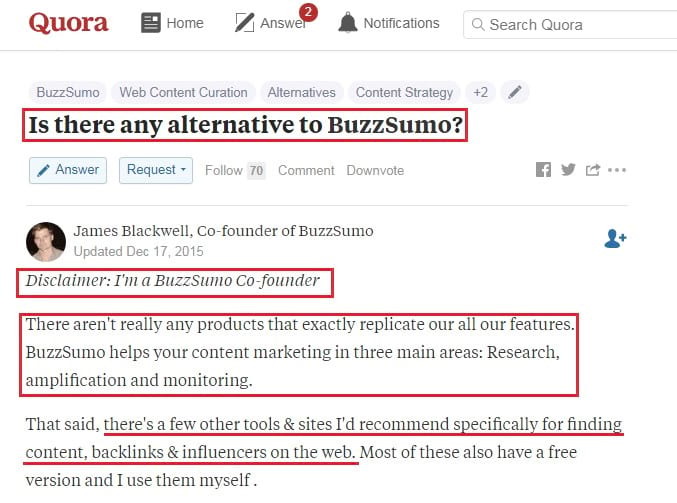 While there are lots of related questions and answers regarding Buzzsumo, we can clearly see that even the founder of the app is using Quora to market their services and shed some light upon the most common questions rose regarding this service. Quora is a great platform for expanding your knowledge. It is popular among Internet users and at the same time, an encyclopedic database where anybody can ask questions and have them answered by professionals and experts. Because the platform is open for everybody, in time, it has become not only a great source for knowledge but also an important marketing channel for experts who want to share their knowledge and at the same time, market their brands or businesses. It’s free, it works, it is open to a large audience. Therefore, it would be a bad choice not to at least try it.